ST. GEORGE – With the primary election just a few days away, the Republican candidates for governor have been busy seeking to shore-up last minute support among prospective voters. Jonathan Johnson, who is incumbent Gov. Gary Herbert’s inter-party opponent, said he wholly expects to walk away as the Utah GOP’s nominee for governor next Tuesday. “I’m confident that June 28th’s going to be an exciting and victorious day,” Johnson said with a smile Friday, adding he was confident in his run to unseat the incumbent. 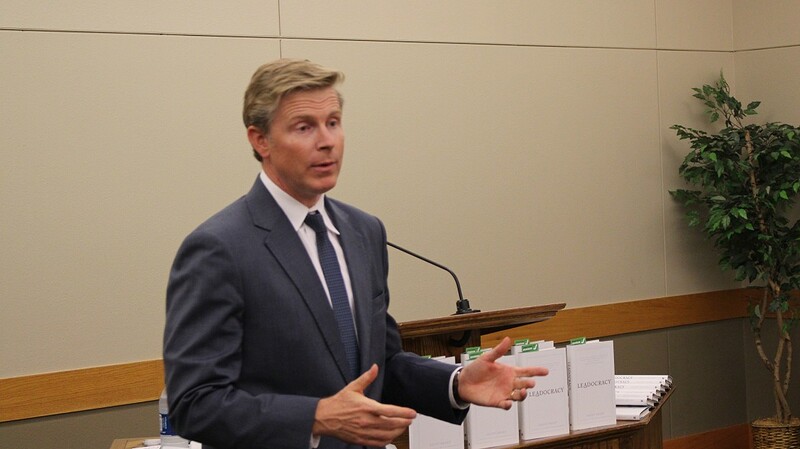 Despite recent polls from Utah Policy and The Salt Lake Tribune that place Herbert ahead of Johnson, the attorney and Overstock.com chairman wasn’t phased. According to internal polling done by his own campaign, Johnson said, the numbers are more even. “I fully expect to win Tuesday.” he said. In relation to his opponent, Johnson has been quick to point out their differences in policy. He has also criticized the governor for matters relating to campaign donations, and has accused him of seeking donations from lobbyists with a promise of meeting with them and ultimately giving them the results they wanted. Johnson said what Herbert had done was pay-for-play, quid pro quo fundraising. Herbert’s comments about meeting with lobbyists for campaign donations come from of a recording that was leaked to media in May. During the meeting, Herbert referred to himself as “Available Jones,” referencing a character from the “Li’l Abner” comic strip who was available for anything for a price. During a call with St. George News Friday, Herbert said his words had been misrepresented and called Johnson’s accusation hypocritical. This is because the people Herbert was speaking to represented business interest in the state whom he said both he and Johnson have sought campaign donations from. 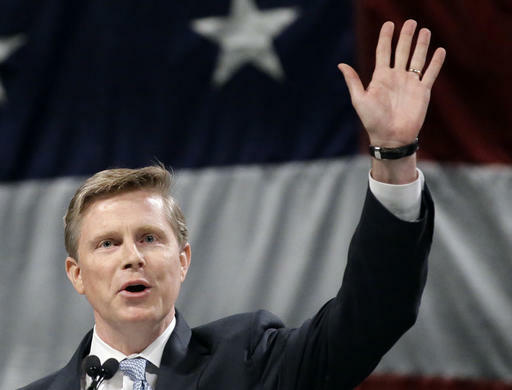 Johnson’s campaign has received around $850,000 from Overstock.com CEO Patrick Byrne, who has become the campaigns single-largest donor. “He has never asked me for any favor because of it,” Johnson said, adding he also hasn’t promised any favors in return. 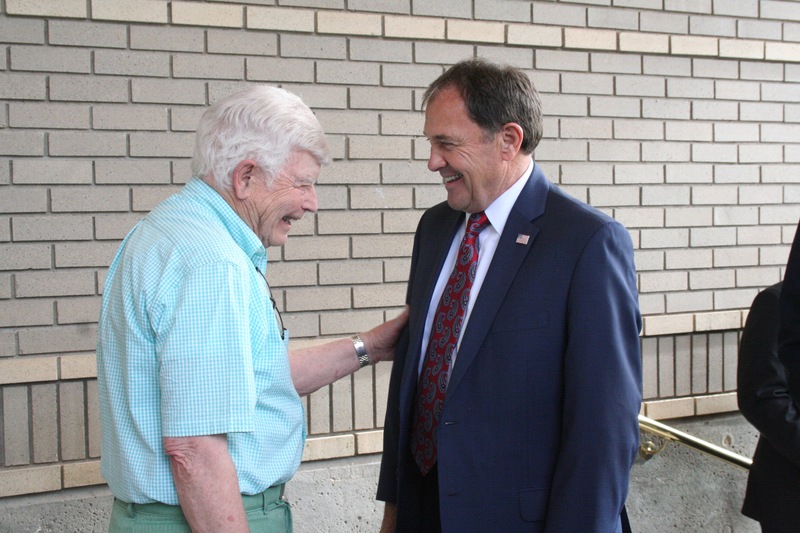 As for telling business lobbyists he would get them the results they wanted, Herbert said he was actually talking about maintaining Utah’s business-friendly environment, and nothing more. “We’re had a great success story in coming out of the Great Recession,” Herbert said, and again noted Utah’s being named the No. 1 economy in the county and the best state for business. VIDEO: Gov. 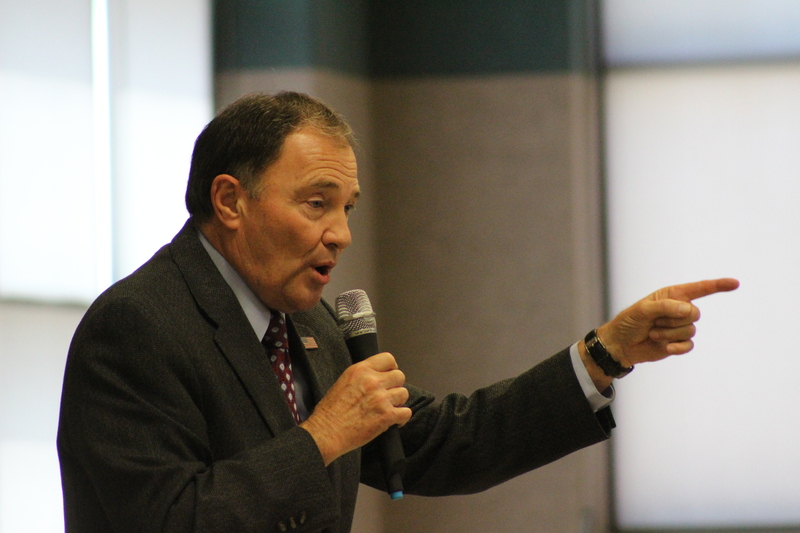 Gary Herbert speaks to the issues of public lands, economic development and water while visiting Cedar City. Johnson said the economy has done well, and could be better. In a plan outlining his first 100 days as governor, Johnson said he would see to reducing or eliminating the state’s corporate income tax across the board. He also wants to ease Utah’s occupational licensing requirements. Utah has the 13th highest licensing burden in the country, Johnson said. Certain jobs, like a hair braider for example, shouldn’t require a license. If a person does the job badly, than he or she goes out of business. Let the free market decide over the state, he said. Licensing shouldn’t be a barrier to starting a small business, Johnson said. On economic development, Johnson wants to promote business growth not only in the Wasatch Front, but also across the state – rural Utah in particular. In Washington County, he said institutions like Dixie State University and Dixie Applied Technology College need to be continually supported and built up in order to produce an educated and qualified work force. Another large area Johnson and Herbert differ on is gaining state control of public lands. Johnson said he would pull the trigger on a potentially $14 million lawsuit against the federal government over the matter. Herbert has chosen to let the lawsuit sit for now, and give legislation proposed by Rep. Rob Bishop, known as the Public Lands Initiative, a chance to play out. Johnson also plans to pursue term limits and repeal the so-called Count My Vote compromise bill, also known as SB54, during his first 100 days in office. As for the governor, he said his priority for the next four years is education. Just as Utah has become the No. 1 economy in the country during his time as governor, he now wants to do the same with education. “Our next goal is making sure education in Utah is the best performing education system in all of America,” he said. The primary election is June 28. Locations of voting locations can be found on the VoteUtah.gov website. Johnathan Johnson is the person Utah needs to lead us forward and that only speaks from one side of his mouth. The person special interest don’t want to win. The person state delegates voted for (55% to 45%). The person who looks for solutions and not campaign funding. The person who does not want or will accept a third term in the office. The person who will get what belongs to Utah from the federal government. yes, but will he get the mormon vote? LMAO how do I do it !